I have a new addiction: No, not drugs or smoking or alcohol, it's Kuretake Zig pens. Thanks to Nikira. What a great way to approach a painting. This is one of the shacks on Paulston's farm. I chose to do a study first before the actual painting. Using my new zig pen, and a little bit of a watercolor wash. Great fun. The second is just various shades of blue ink also using Kuretake Zig pen. The third is the Meadow Croft estate, in sepia ink. Whether or not these turn into a painting is still undecided, but it takes me a step further than the usual thumb nail studies, while trying to improve my drawing skills. Yep a little bit of sugar helps etc. etc. Drawing has never been my strong suit, so the pens do help to motivate me. HAPPY PAINTING EVERYONE. I would love to take this moment of peace and quiet to wish all of my fellow blogger a very safe and healthy Thanksgiving. For all who do not live in the US. I will simply wish you a very Happy Thursday. 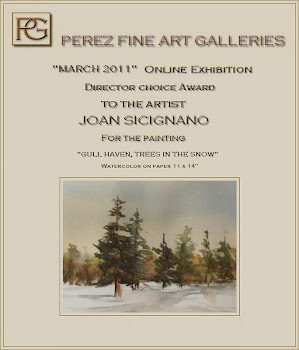 As for my painting, it was juried into the Vineyard show in Greenport. Very excited about the show and just thankful for the is amazing joy that I feel every time there is a brush or pen in my hand. Happy Painting Everyone. As you can see, I have crossed over and joined some of my fellow bloggers who enjoy sketching with various pens. There are several post on my side bar of the groups or artist who enjoy sketching on a daily basis. In the picture are some of my latest toys. John W J. you are so right about treating yourself to art supplies for you special day. My latest is the Noodlers fountain pen. I am also expecting a delivery from Jet Pens. Reading Nikiraart blog I wanted to try the Kuretake pens, can't wait to get them. Happy painting or drawing everyone. I have been still trying to do David Dunlop's watercolor with acrylic gloss medium paper prep. In my previous post I mentioned gesso as the preparation , well both can be used. Gotta say, it aint easy. This is actually a very old technique used by the masters such as Turner and others. It gives us a chance to treat watercolor as an oil painting. The paint can be applied and then either taken off with a brush to either correct or add highlights. It gets tricky. It's fun, but I prefer watercolor painting being just that a watercolor with all the spontinaeity that comes with that medium. It's a quick kill or very successful. But as you all now I do love trying new techniques. Happy Painting everyone. Yesterday we went back to Meadow Farm. A lovely place to paint. I used the opportunity to do some sketching rather than paint in oil or acrylic. The only sketch I did was the wood shed. Today in the studio with the help of digital photos I have been working at different methods to achieve my desire to do justice to this enchanted farm. My favorite is the shed, still have to work on the roof line. Happy painting everyone. I received my new toys, SAI watercolor brushes and had a ball experimenting. The larger paintings are a David Dunlop technique that I learned. It's watercolor that can be erased by preparing the paper with gesso. Colors can be applied or wiped off with ease. It's amazing how it works, still haven't mastered the technique but great fun learning new things. Must run, Mike and I are on our way out, but will return to visit all of you latest post and to thank you all for the wonderful comment on my previous post. Where does the time go? Cottman watercolor travel watercolor paints. It never ceases to amaze me how paper, paint and brushes handle so differently. It's like riding a bucking horse. Needless to say, today I was thrown, but I will be back in the saddle tomorrow. Happing Painting everyone. We went to the Arboretum on Tuesday. Where or where are the fall colors. These are 2 6x8 acrylic paintings started at the aboretum and completed at home.